I’ve always been fascinated with things that are encased in clear resin or glass. Having them frozen in space and being able to study them carefully from all angles is just so amazing. In today’s video I show how to use UV resin to preserve tiny bits of flowers, leaves and grasses as molded cabochons. 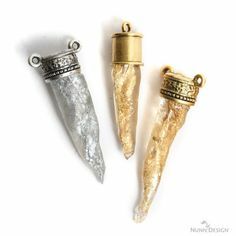 You can then glue on a bail or drill holes to make these pieces into whatever jewelry you like. This would be the perfect way to preserve flowers from a bridal bouquet or any other occasion you’d like to remember. Make sure to plan for test runs. As I show in the video, things don’t always turn out like you think they will. 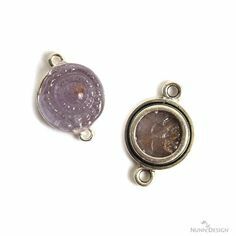 Watch the Nature’s Treasures-Resin Pendant Jewelry Tutorial at YouTube. Thank you so much for this wonderful video. I’ve been looking for ways to combine the pleasure of jewellery making with my woodland walks — now I have a way! I saw in the comments that some people were saying the flowers would rot after a while, so has that happened at all or have they stayed? Thanks again! Hi Rachel, I’m glad you like the video and that it’s given you some creative inspiration! Yes, the issue of drying/not drying the flowers has been hotly debated, as you pointed out. I’m not 100% certain, but I think my success with the technique is because I used a UV resin (Magic Glos) which does not have the same chemical reactions as other resins, which is what I suspect reacted with the moisture in the flowers. 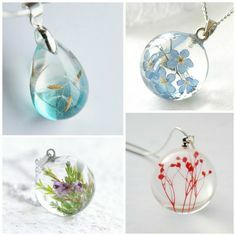 The flowers I preserved in the resin look the same today as they did 18 months ago when I made them. Feel free to chime in on the video comments with the results of any experimenting you do!